Finally a little heat up in here! With warm weather finally arriving (and hopefully here to stay!) I tested out an ice cream pie for the holiday weekend. 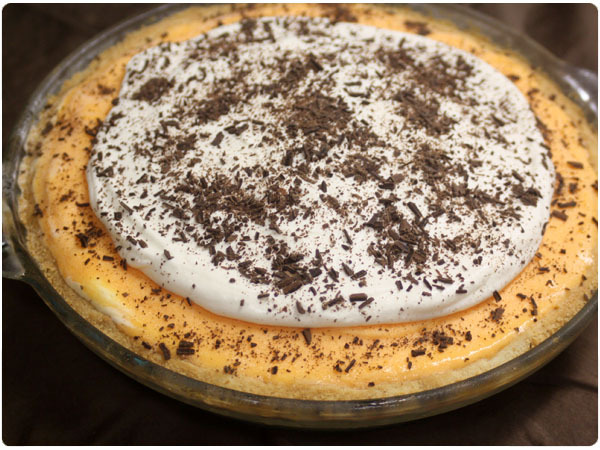 I’d been wanting to experiment with an ice cream pie for awhile and thought the classic combo of vanilla and orange would be a good way to start. 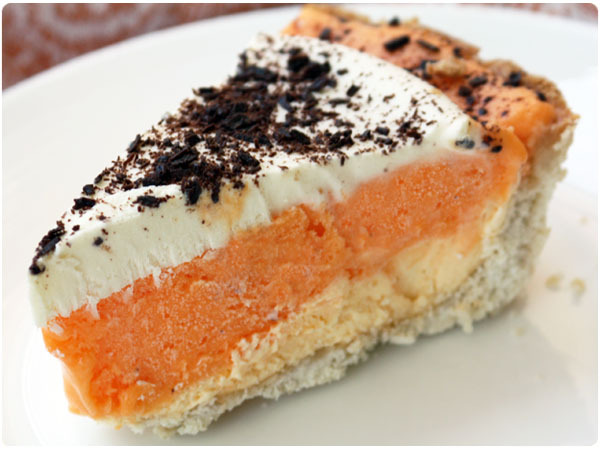 As it turns out, ice cream pies are super easy so I think I’ll be playing with flavor combos all summer, however this Dreamsicle-style pie is a refreshing, cool dessert for any hot day. Preheat oven to 400. Beat together sugar and butter until fluffy. Beat in flour and salt. Beat in milk and vanilla until mixture is crumbly. Butter or spray a glass pie pan with PAM. Press cookie dough into pan, using your fingers to work dough evenly up the sides and evenly across the bottom. Bake for 20-22 minutes. Cool completely. Meanwhile, let vanilla ice cream soften. 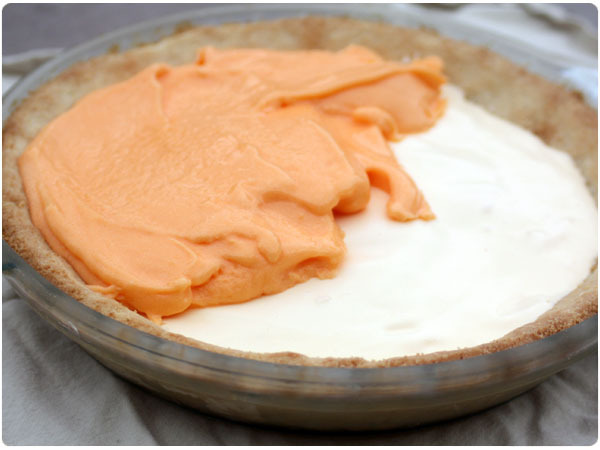 Once semi-soft, use a spatula to spoon a layer of ice cream in about half way up the pie shell. Return to freezer until ice cream hardens, meanwhile softening sherbet. Repeat step with sherbet, smoothing directly on top of vanilla ice cream, and return to freezer until fully frozen. In a small bowl, beat together heavy whipping cream, sugar and vanilla until stiff peaks form, about 3-5 minutes. Spread whipped cream on top of ice cream pie and top with chocolate shavings. Use a knife warmed under hot water to slice and serve. NOTE: If you don’t grease the pie pan first, like me, it will be difficult to get the slices out cleanly. I think butter or a light dose of cooking spray would probably do the trick but can’t say for sure since I didn’t realize I needed it. If you know a good tip, please share! Love that your pie crust doesn’t need to be rolled, that stresses me out, but I think I could handle pressing cookie dough into a pie pan! The orange vanilla combo with dark chocolate shavings look divine! Just need some sunshine in our part of the world and I’ll give this a go! what a great idea! ive never had a creamsicle pie!! xoxo jillian:: enter to win a leigh viner print! I hope this pie comes to me in dreamland; this looks perfect for the heat all up in my apartment. I love when it’s finally warm enough to start eating icecream. I think that first batch of homemade icecream is the highlight of my summer! This pie looks delicious – I’ve yet to make anything with my icecream – I eat it too quickly to even think about going to the next level! @Sharon – thanks for the tip! Let me know if you try the PAM with success.